My life has some some past connection with water. When I was about 7 years old, we went on a family trip to various temples in South India. One such place we visited was Devipattinam, a coastal village in Ramanathapuram District in Tamil Nadu. 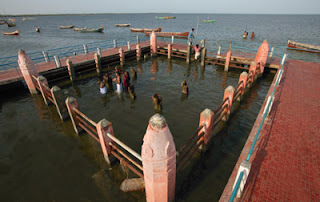 This place is famous for their Navagraha temple which is in a form unique to this place. There is a story that Rama had to calm the sea to build his bridge to Lanka , and he installed nine stones as a representation of the Navagrahas or the nine planets. You would see nine stones partly submerged in water in the sea close to the beach near to the famous Thilakeshwar temple. So we had to go 9 rounds the nine stones inside a fenced structure in water. At 7 years, I was one of the shortest kid in my age group and definitely the water level was up to my neck when I was walking with my parents and other relatives during the nine rounds inside the fence. But it so happened I slipped and went inside the water. I had no clue of swimming. And as you drown in water you struggle to come out and I tried about 3 times and could not , and started to be going with the tide and just about to cross the fence and get washed into the sea. All my relatives panicked and my uncle who caught me by my hair just a second before I was taken away by water near the fence. I must have gone with water long ago. But some how saved, and my mother ensured that I learn swimming after this incident. She took me to a local pool in Coimbatore to put me in Swimming class. I drank enough water in the pool too , and even cried I would die if I am left in the pool. My coach forced me to swim. I struggled and learnt a bit of survivor swimming during that course and managed to swim with my head out like a dog pedal. One thing I was comfortable was just float in water with face up, I had enough body fat that time my buoyancy was phenomenal. I could float without doing anything in water. But not much of swimming any happened during the course. Its been more than 20 years since this incident happened. Though I did not really continue much on my swimming endeavors till I moved to Mumbai for my first job with TCS. But there was some attraction with water that pulled me into the nearby pool and I started to swim. I hard could complete a lap because I never learnt properly how to breath in water. All I know was to kick the legs and move my arms to move forward. When I moved to a new apartment with my friends in second year with TCS, there was a dedicated club house where I started to go regularly. I used to watch the way kids swim and tried to practice a bit of swimming in laps for the first time. Then later XL life was busy in Jamshedpur and never ventured swimming much till I moved to Hyderabad. I saw the Gachibowli pool in Hyderabad and there was an instant attraction again to jump in water. I had a chance to go on a rotation program in Redmond in 2010. It was only then, my skip level manager Matt , taught me the basics of swimming and how to breath while in water. I was lucky to get a 3 month of membership in an awesome sports club in Redmond. I did 3 months of continuous practice to really improved my swimming. I had posted about this in 2010.